« another attempt at do we depend on our D tech a little toomuch!!! A Book Review & A Fond Farewell …For Now!! “The Sweet Blessing: My Adventures In Diabetes” is an INCREDIBLE book that I had the good fortune to spend a rainy Sunday afternoon reading. But more on that in an upcoming paragraph!!!! First, I’d like to thank my old friend, Novolog, for almost four years of service!! I’ve been using it since my diagnosis in 2013 & have known no other fast acting insulin. 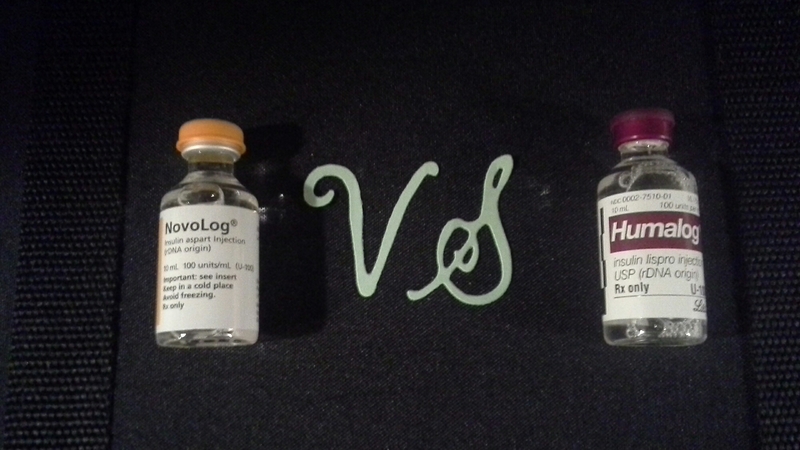 But my medical insurance, in their infinite wisdom, has decided that my beloved Novolog has to hit the road & I must welcome the newcomer, Humalog!! I’m not sure how I feel about this change but I’m open to giving it a shot…pun intended!! So, tomorrow when I change my infusion set, I will fill my reservoir with Humalog for the trial run. I will post how it goes with, hopefully, my new friend. If anyone has any stories, experiences or even advice about switching any kind of insulin, I’m all ears. I welcome advice and information in any form. Now, here is a review of Trisha Porretti’s, “The Sweet Blessing”. Before I get into the book, let me first introduce Ms. Porretti RN, BSN, CDE, a diabetes advocate & although I have never met her, I feel I can confidently say, she’s an all around good egg. How could she not be?? She believes in the power of laughter as a working member of any person’s medical team which makes me admire her & her work so much more. In the back of her book there is an excellent bio that briefly describes her accomplishments of which there are many!! I wont try to rewrite what has already been done so eloquently. Ms. Porretti is from a Roman Catholic family, as I am and she spent 12 years in Catholic school including an all girls high school. I didn’t spend all of my school years in Catholic school, but I was taught for a good many years by the Sisters of St Joseph as the author was. I can definitely relate to the author’s affinity for the Blessed Mother, aka, Mary, the mother of God/Jesus. My Dad hung a bust of Mary on our bedroom wall & frequently reminded my sister and I to say our Rosary to the Blessed Mother before we went to sleep. Ms Porretti, humorously describes her on again, off again & then back on, relationship with prayer where she frequently sought Mary’s intercesstion in helping her get through a particularly rough time. And when she least expects it, Mary takes a front seat in Trisha’s life in a very big way. The bio in the back of the book describes Ms Porretti as a Laugh Leader & she describes how she uses these laughter techniques throughout her life. And on many occassions, she was invited to perform a stand up comedy routine to crowds of varying sizes all to the delight of the audiences present. As many of u know, I have tried to use laughter throughout my years with chronic illness & I believe the Blessed Mother Mary, put my now husband into my life so that we would each be able to comfort the other during bad and good times with our funny, although some may call them warped, senses of humor. One of the many touching stories is how Trisha went to Diabetes Camp as one of the pediatric nurses on staff. Since she was diagnosed as an adult, she didn’t have the opportunity to go to diabetes camp as a kid, but she makes up for that it many ways forming life long friendships with many of the campers and staff alike. I could go on & on about this book. I loved it so much and related in so many ways to the author’s story, but I won’t bore you all with what I thought when you can get a copy of your own on Amazon & read it yourself. “The Sweet Blessing:My Adventures In Diabetes” is a very serious yet funny and sweet look at diabetes through Trisha Porretti’s life. I hope those of you who read it will fall in love with Trisha as I have. Enjoy!!! Remeber to CHECK!!! Don’t GUESS!! !